Greetings! 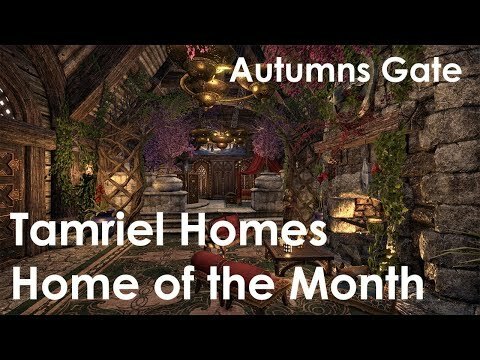 It's Sham from Tamriel Homes and I'm here to share our featured Home of the Month again, now for November! We're a player housing community founded in Feb 2017 at the PC/EU server. 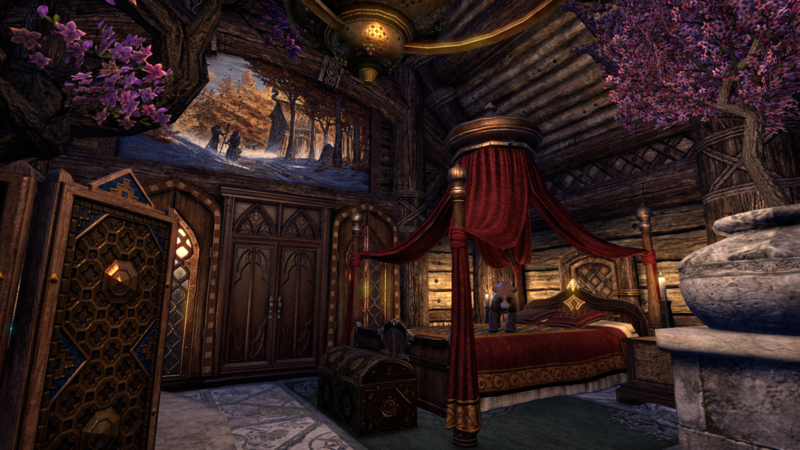 Our Homes of the Month are picked each month by vote by our community members, and the creators of these featured homes get interviewed about their creations and on their take on ESO's player housing in general. In addition they also get some Crown Store goods as a small bonus. 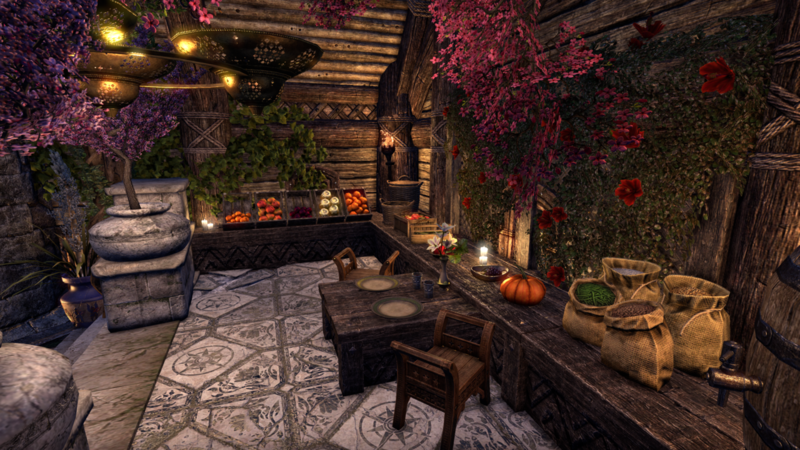 Our November's featured Home of the Month is @Peaceruler's Autumn's-Gate: “Warden's Retreat." This version of Autumn’s-Gate offers a very cozy and colorful take on the Nord house with well controlled and coherent arrangements. In this post you can find some pictures of the home, but if you are playing in the PC/EU-server, it is recommended that you visit the house in game to experience and see what it is feels and looks like in person! 1. Q: From what sort of creative background are you coming from? Do you have any other creative pursuits or hobbies? What are your preferred forms of self expression? A: I don’t really have a creative background. As a child, I’ve never really been good at arts and crafts. But I did like watching other people’s creations. The only creative hobby I was any good at was writing short stories. Ever since housing came out, I’ve been very enthusiastic about it. And this has now become my primary creative pursuit. 2. Q: Where did you find inspiration for this particular concept? Did you have any points of reference? A: My main sources of inspiration are the many videos from other people decorating houses. I like seeing what other people can create and take inspiration from that. I also check the ESO forum for ideas. 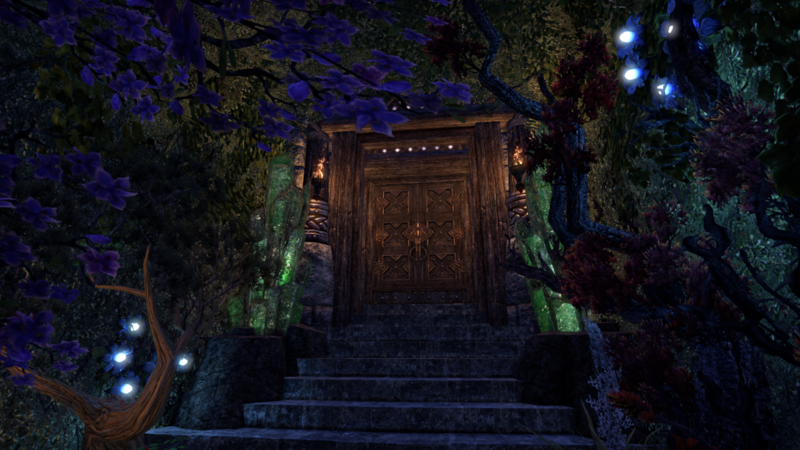 If you’ve seen my other houses, you know I like the many coloured trees that ESO has, and using lighting, candle lights and enchanted lights are my favourite. After googling “Thomas Kincade”, I realized I may also have been inspired by the many puzzles of this man’s art my mother made when I was younger. 3. Q: What did you prioritize with your approach to the concept? Did you have any core ideas, or principles that you aimed to follow? A: As I said earlier, I usually decorate houses for my characters. This house was designed for my Warden Tank character, named Lyanna of Bear Island. Nowadays I play her the most and bring her to the most dangerous of DLC dungeons. Therefore I thought she deserved a house that was pretty as well as comfortable, with nature having slightly taken it over, because she’s a Warden after all. 4. Q: Which parts of this concept did you find the most challenging parts to design? A: Lining up the hedges in the area outside! xD So you can’t see through them. I’ve used twenty of them. 5. Q: Are there any specific areas or details you’d like to highlight in particular, and tell us about how you came up with them? A: This house consists of only one big room and I wanted to divide that into three parts: Bedroom with inside bathroom, Sitting Room and a Kitchen. Enter Summerset and its lovely ballroom floors, stairs and fences, and I could finally do that. I’d already seen other people creating elevated places in their homes, and I thought this home would be perfect for it. 6. Q: Do you have any housing related tips or thoughts you’d like to share with the rest of the community? 7. 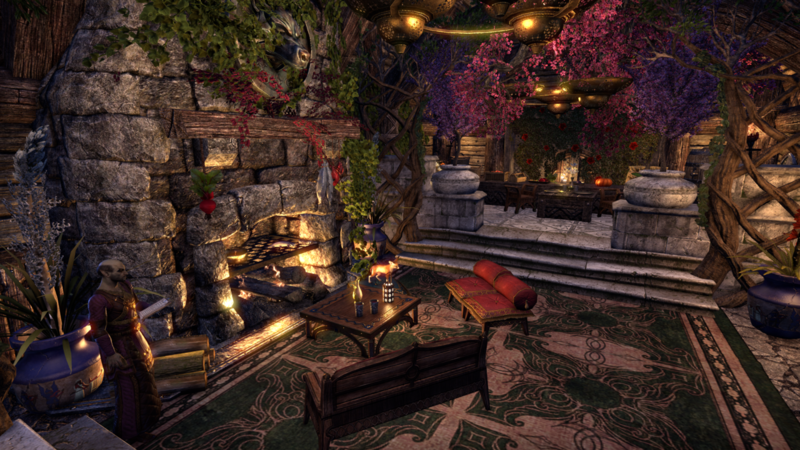 Q: If you could ask Zenimax to improve the player housing in ESO in some way, which changes would be on the top of your list and why? A: More choices in floors and walls. 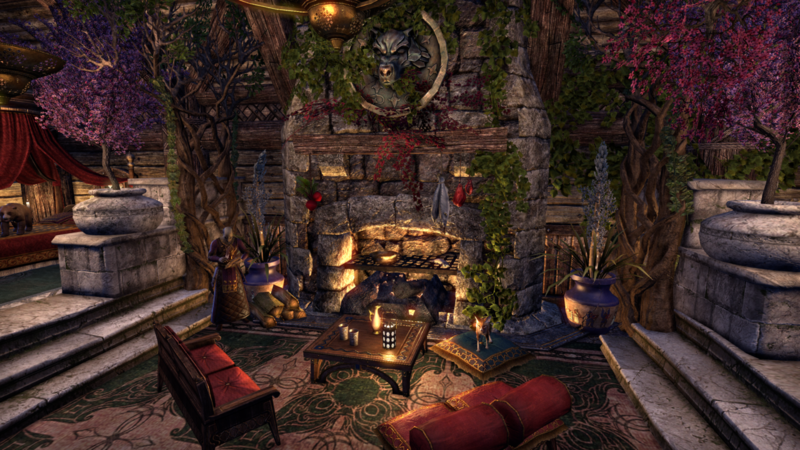 I’m happy with the stuff we got in Summerset and Murkmire, but I would really like to have more choices in different type of stone and wooden floors and walls, and in different sizes. Same goes for stairs. 8. Q: Lastly, what sort of future plans do you have player housing-wise? Can we expect to see more from you? A: I’m currently trying to build a house from scratch. Let’s say I’m better at making existing houses look pretty. But you’ll definitely see more of me, whether it’s that house or others I’ve already made, or houses I’ll make in the future. Thanks for sharing your creation and thoughts with us! We’ll be looking forward to see more from you in the future! We also have a video featuring a tour around @Peaceruler's home, in case you cannot visit it in gamel! The video is provided by our member @Elara_Northwind, whose channel is also worth checking out for many more great creations! 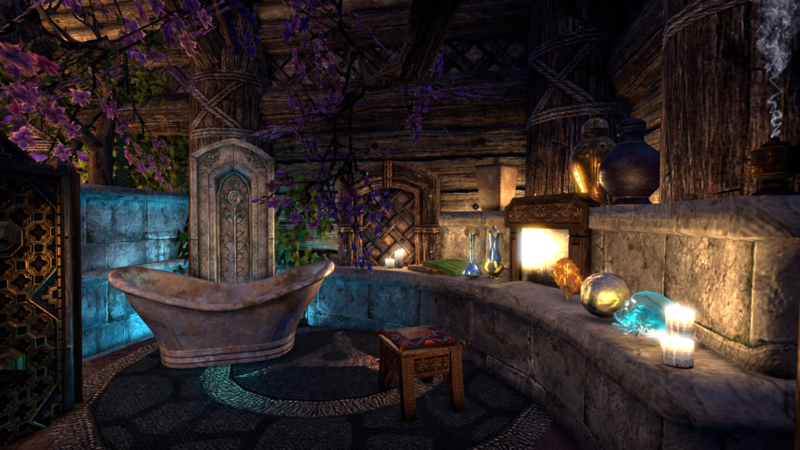 Tamriel Homes thanks you for your time! This is so inspiring! I need to make a EU character and come check out all the housing goodness! 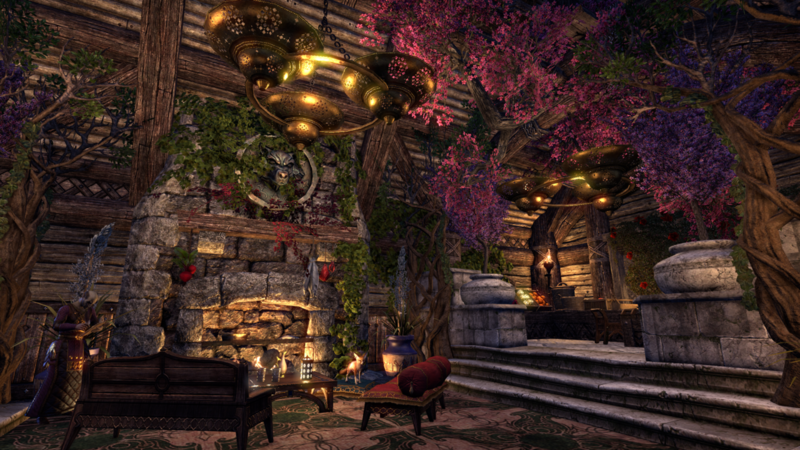 Autumn's Gate is already one of my favourite houses, but I absolutely adore the touch of spring you've brought to it. Elegant and cosy at the same time, very impressive!